I was thinking about things we might do in the first lab day for the Applied Circuits course next quarter, now that I have 2 lab sessions a week. The first, obvious thing is to unpack the lab kits and identify the different components, labeling the capacitor zip locks with values of the contained capacitors, and learning to use the wire strippers, the power supplies, and the voltmeters. I’m thinking that I should have the students make a 3′ red-black twisted pair and pack it with their parts, so that they don’t try getting new power wires every week. One experiment I was considering having them do is to look at the AC signal from a large loop of wire and from twisted pair, to see the difference in noise pickup. I tried doing this at home today, with rather disappointing results. The large loop did not pick up more 60Hz noise than the twisted pair when viewed on either my Kikusui oscilloscope or by Bitscope USB oscilloscope. In fact I couldn’t see any noise with either one. I tried adding my 1500-gain EKG amplifier as a front end, and then I could see about 60μV noise, but that did not change whether I used a long loop, a twisted pair, or a very short loop between the instrumentation amp inputs. Looking at shorted inputs for the AC-coupled DP01 active probe in its high gain mode. This is 2mV/division, 100µs/division, “macro” mode. The noise is a couple of mV, about the same as the noise level without the DP01, but the resolution is much better with the DP01. The high-speed trace here is to show the component of the noise that is around 30.8kHz, which is about as big as the 60Hz component. 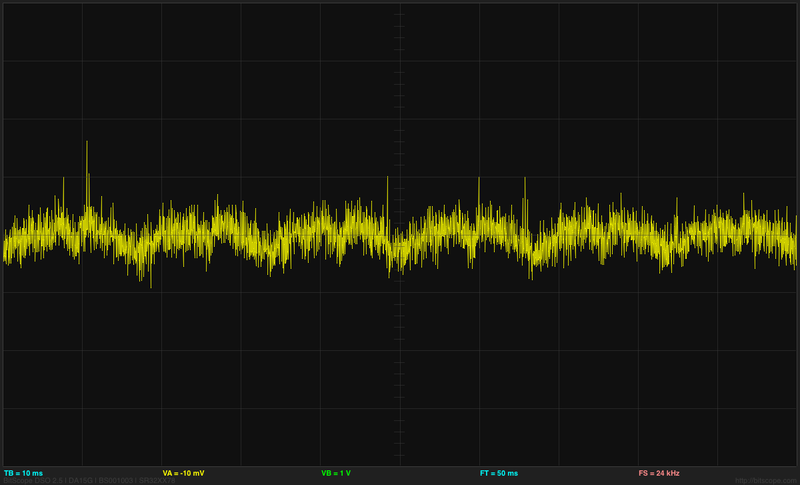 The 30.8kHz noise is most likely from the USB power supply into the Bitscope. The Bitscope does not appear to have as good power-supply noise rejection as one might want. I then hooked up the EKG amplifier board (which should have a gain around 1508) using a separate power supply, and looked at the noise on the Vref signal (which is just buffered from a voltage divider on the power supply). At 2mV per division and 10ms per division, we can see a little 60Hz noise added to the high-frequency noise of the Bitscope, but the noise is still only 2–3mV, which would be an input-referenced noise of about 2µV given the amplifier gain around 1500. 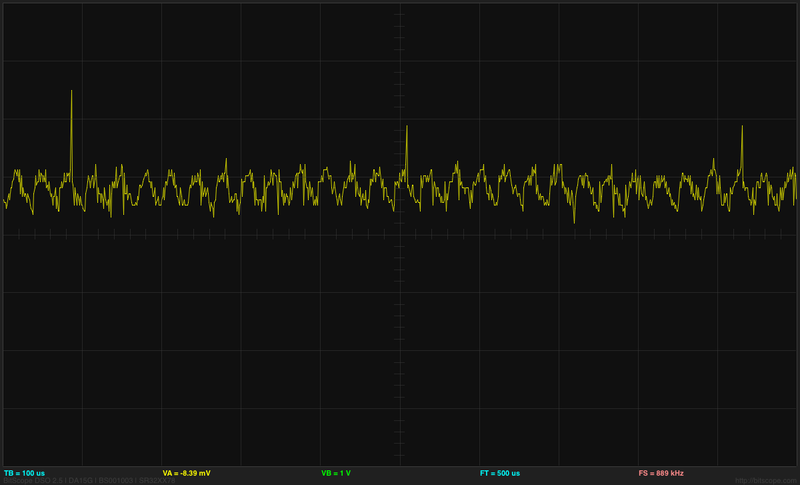 The noise on Vref is not much more than noise inherent to the Bitscope and is very similar to the noise I see looking just at the output of the power supply without the EKG attached. 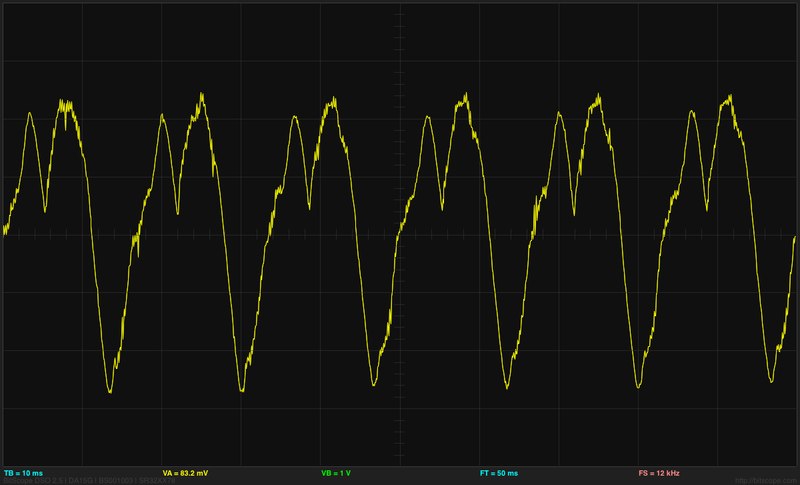 Next I looked at the output of the EKG, with both inputs shorted to Vref. 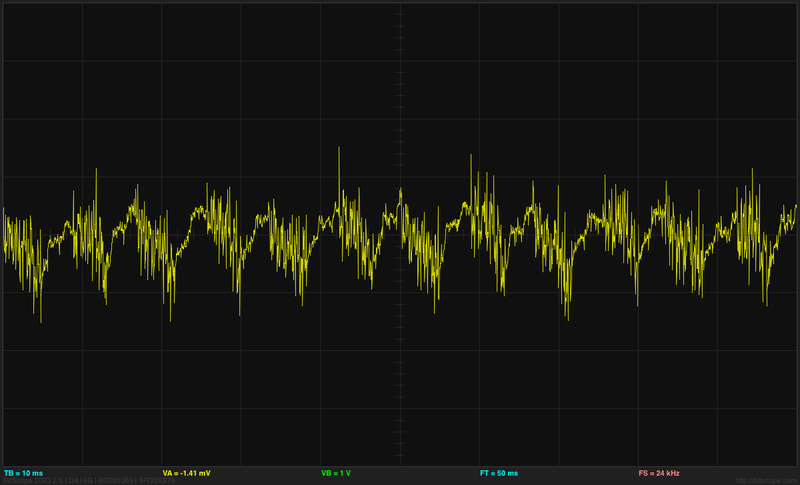 This is now 40mv/division and 10ms/division looking at the output of the EKG amplifer with both inputs shorted to Vref. The output noise is around 90mV, so the input-referenced noise is around 60µV. Now we see a signal that is not just Bitscope or power supply noise, and have a noise floor for looking at signals at the input of the EKG amplifier. 200mV/division, 10msec/division. Inputs of EKG amplifier separately connected to Vref via 2.2MΩ resistors. This signal is about 1.04V peak-to-peak (so the input is about 690µV). The output can be changed substantially by putting my hand near the resistors—the 60Hz noise appears to be capacitively coupled into the amplifier. I can reduce the peak-to-peak voltage to about 500mV (that is around 300µV at the input) and make it have a larger 120Hz that is almost 10dB larger than the 60Hz component, , just by moving my finger around near the resistors. I can also raise the signal until the EKG amplifier is swinging rail-to-rail (at least 3mV at the input). So I don’t have a demonstration circuit for electromagnetic pickup here, but I do have one for capacitive coupling. 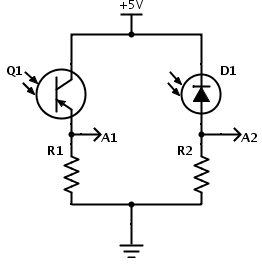 To detect currents induced in a loop, I probably need a transimpedance amplifier to detect small currents, rather than an instrumentation amplifier to detect small voltages . I’ll leave that for a separate post. I forgot to type up notes after the sixth day of the freshman design seminar, because I had a meeting right afterwards. I’ll try to make up the deficit now, two days later. At the beginning of class I collected the homework (which had originally been due Monday, but which I had given an extension on, so that students could do it right). I’ve not looked at it yet, but I could tell when I collected it that students had taken to heart the message to type up their homework and put some care into it. I hope that spills over into their other classes—not only will it benefit them, but it will help our department if the bioengineering students get a reputation for being diligent and meticulous. The whole Biomed building seems to be half empty and even the occupied lab bays have a huge amount of space per person, especially compared to the rather cramped labs stuffed with students and researchers that we saw in Baskin a couple of weeks ago, which makes it irksome that the University administration has been preventing our department from doing recruiting for wet-lab faculty for lack of lab space. All the space is earmarked for growth in a different department, which would take them 10 years to fill (if they ever manage to do so). The space planning on our campus seems to be done by turf wars between deans with no central rebalancing, and one dean (not ours) now holds all the empty space on campus. Our dean has an unimproved warehouse 3 miles away which would cost millions to convert into anything usable, even if it made sense to exile active researchers from campus. The lab tour ran a bit long, and half the class had to leave, but the other half got an interesting discussion about getting into research as an undergrad from a grad student who had been an undergrad here. The e-mail mailing list for the class is still not serving its function of providing an out-of-class discussion space. Only eight students have posted anything and no student has responded to another student. The list is still useful for my making announcement (like when homework has been posted on the web site), but it isn’t working as a discussion forum. I’m apparently not very good at creating online discussions—I’ve not gotten them to work in classes yet, and even this blog has 86 views for every comment (and 40% of those comments are mine, so the ratio is more like 144 views per external comment). I looked for some stats on MOOC discussion groups, to see how my online discussion compares with classes that are only on-line. I found a series of blog posts by Jeffrey Pomerantz where he analyzes the data for a MOOC course he is teaching. The one about online discussions showed him getting 1787 posts and 707 comments in 8 weeks, for a class whose size was 27623 total registrants, 14130 active students, 9321 video viewers, 2938 who did one homework, or 1418 who completed the course (numbers from his post about course completion). If we take the video viewers as the most realistic measure of the class size, we get about 3.3% of the students posting or commenting per week. Maybe my 60% participation in one week is not as bad as I feared, even if it doesn’t have the feel of a discussion yet. As many of you may know, Shakespeare Santa Cruz—at least as a campus-sponsored activity—ended last month with the holiday production of It’s a Wonderful Life: A Live Radio Play. The decision that the campus could no longer afford to provide ongoing financial support to Shakespeare Santa Cruz was one of the most difficult of my tenure as chancellor. However, as you may have heard, a community-based nonprofit group—Shakespeare Play On—is spearheading a drive to establish a more financially viable company and relaunch the popular festival in time for a Summer 2014 season. Their representatives and the campus are actively discussing the possible use of the Stanley-Sinsheimer Glen and other facilities on campus. The new company has already received tremendous donor support for this ambitious undertaking. Yet, representatives of Shakespeare Play On have told me that this remains a critical time for the organization—and they asked that I write to you and other past supporters of Shakespeare Santa Cruz, letting you know that help is still needed. If you are interested in Shakespeare Play On, please take a few minutes to learn more about the organization and its financial needs. You may do so by visiting www.shakespeareplayon.net. On behalf of the campus, please also accept my heartfelt thanks for your past support of Shakespeare Santa Cruz. The performances, the designs, the staging—literally everything about the productions—would not have been possible without the support of people like you. I am sure Shakespeare Play On would be as appreciative of your generosity as the campus was during the festival’s first 32 years. This letter is gracious, but a bit late (mid-December would have been much more valuable). I hope it comes in time to do some good.